Note: This piece originally appeared in the National Council on Public History’s blog History@Work. We thank NCPH for giving us permission to reproduce it here. The idea that international work shaped the NPS as early as 1918 may appear surprising because popular imaginings of the NPS traditionally center on the mystique of Western parks like Yellowstone and Yosemite. The parks are often perceived as the stronghold of the uniformed figure of the knowledgeable, but fun, park ranger traversing the West’s expansive landscapes. These fascinations are best illustrated in Ken Burns’ documentary The National Parks: America’s Best Idea (2009). “America’s best idea,” a phrase coined by writer Wallace Stegner, drives Burns’ portrayal of the parks. It focuses on the “invention” of the national park “idea” to preserve American natural landscapes, and later, in the 1930s, its cultural sites. However, Burns and even the agency itself have failed to engage as rigorously with the remainder of the agency’s twentieth-century history. This type of institutional amnesia makes it difficult for some narratives to make their way into the larger story. For example, where is the equal focus on cultural parks, which by the way, make up two-thirds of the NPS’s 400+ units? And more intriguingly, what about that bit about international engagement? My research has examined the NPS’s engagement overseas, specifically when it founded the Division of International Affairs (DIA) in 1961. In that time, NPS Director Conrad Wirth began to expand the agency in time for its fiftieth anniversary in 1966. Sweeping changes—and $1 billion in federal money over a decade—included buying new lands to build parks, building accessible roads, and revamping visitor centers and interpretation capabilities to make the agency bigger, better, and more equipped to host an unprecedented influx of park visitors in the postwar years. But this vision spilled over domestic borders, as the NPS sought to expand its work during Wirth’s Mission 66 initiative. The DIA was established to create an overseas support network regarding conservation issues and broadly about national parks, but it was also organized to provide technical assistance to nations seeking to build their own national parks.In one compelling case, scholars Lary Dilsaver and Terence Young briefly describe the first official DIA trip to Jordan in 1966 to the ancient site of Petra. Twelve NPS employees and their families relocated to Jordan, where they were tasked with rebuilding six historic sites and teaching Jordanian officials to manage this park system in the future. In 1968 the NPS “Team” developed an interpretive plan to meet this purpose. Ultimately, these projects were fueled by larger Cold War anxieties. Often funded by the State Department and the U.S. Agency for International Development, these technical assistance projects fit into larger American concerns about containing communism and other political pressures. The idea that national parks were used as nation-building at the height of the Cold War is a compelling story on its own, but even more importantly, it shows the NPS is not a neutral entity, nor its individual parks neutral spaces. Public historians should be aware of and interrogate the degree to which the NPS has shaped both American and international landscapes, both spatially and ideologically. The NPS Office of International Affairs manages “Sister Park” relationships between parks in the U.S. and overseas. 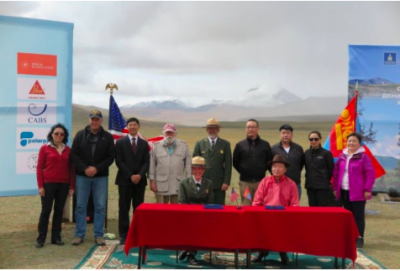 Here is an agreement between Denali National Park and Mongolia, 2017. Image credit: National Park Service. In August 2016, the NPS celebrated its centennial. This time of reflection and future projections invited questions into the perceived simplicity of the NPS origin story and later history. I kept thinking about the success of the NPS as an “idea,” but as a former seasonal NPS employee, I began to see a lot of the issues that scholars raised in the 2014 Imperiled Promise report about the state of the agency. It identifies issues such as lack of support, low funding, and poor historical interpretation, just to name a few. Advises the report, “The more central history can be to the NPS’s missions and activities, the more relevant and responsive NPS can be to the needs of twenty-first century American society.” “How things are normally done” won’t work for the challenges presented by this century. The story of NPS’s international engagement serves as an important tool in reimagining the agency’s future. First, it propels us to think about how its mission has shaped and been shaped by global forces. If we can begin to understand how the NPS has contributed to American power structures domestically and internationally, contextualizing its history within our national narrative can push the NPS to do better history by embracing interpretations of how it has shaped park sites at home and abroad. Secondly, it can strengthen the decreased capacity of today’s renamed Office of International Affairs, as well as engage with global narratives at sites for better interpretation and audience engagement. Finally, rethinking NPS history complicates a simplistic, overtold narrative. If we re-examine a complicated past that challenges what we think we know, we can create something better for the future. Receiving Congressional support in these times is a feat in and of itself when the NPS is under attack on several fronts—lower funding levels, pushback against climate change policy in the NPS’s operating agenda, possible de-nomination of various national monuments, and visitor fee increases in parks, just to name a few. The NPS is imperfect, but its work is worth doing, now more than ever. As concerned, invested, and engaged American residents and history professionals, let’s rethink how it can thrive and make a persuasive case for its importance. Joana Arruda is a public historian whose research interests include twentieth century U.S., material culture, and the National Park Service. Most recently, she served as the International Exchange participant in Paris, France with the International Council of Monuments and Sites. Letter of Franklin K. Lane to Stephen T. Mather, May 13, 1918, in Lary M. Dilsaver, ed., America’s National Park System: the Critical Documents (Lanham, MD: Rowman & Littlefield, 1994), 51. Terence Young and Lary M. Dilsaver, “Collecting and Diffusing “the World’s Best Thought”: International Cooperation by the National Park Service,” The George Wright Forum 28 (2011): 271. Letter of Franklin K. Lane to Stephen T. Mather, May 13, 1918; in Dilsaver, ed., America’s National Park System, 51. Joana Arruda, “The National Park Service Division of International Affairs: The Case for International Perspectives, 1916 – 2016,” M.A. thesis, Temple University, 2016. Young and Dilsaver, “Collecting and Diffusing “the World’s Best Thought”: International Cooperation by the National Park Service,” 271. 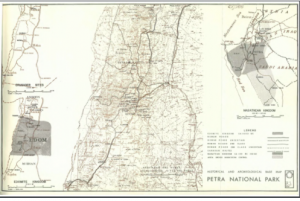 Master Plan for the Protection & Use of Petra National Park, (United States Agency for International Development, 1968): 7. Anne Mitchell Whisnant, Marla R. Miller, Gary B. Nash, and David Thelen, Imperiled Promise: The State of History in the National Park Service, (Bloomington: Organization of American Historians, 2014): 6. Don’t forget Ronald F. Lee’s work in the late ’40s/early ’50s on establishing the framework of what would become the National Register of Historic Places by looking at European practice. Thanks for the note and yes Ron Lee’s contribution was very important. There is so much history to delve into on the cross roads of international heritage. And also many thanks to Joana Arruda for her research on soft diplomacy something we as a nation could use more effectively! Thank you for your comment and for the link to the article on the proposed international park in the Texas borderland. I will consider it for a future Living Landscape Observer Newsletter. Many thanks to Joana Arruda for this excellent piece.